On this video, the very best versions of Matrix have been collected along with several of its earlier ancestors. 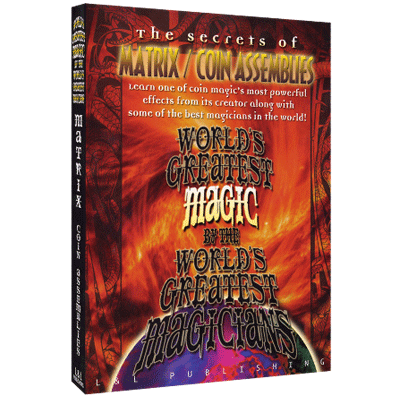 You'll begin your journey by learning the effect that started it all by the man who invented it - Al Schneider's classic Matrix. You'll also learn various handlings of the basic version from Bill Malone and Michael Ammar. Once mastered, you can move on to some eye-popping Reverse Matrix effects, where the coins actually go back to where they came from, with Aldo Colombini and Dan Fleshman. If you'd like to add a killer finale, check out routines by J.C. Wagner and Harry Allen and to prove that there's more to Matrix than coins hopping around, there's Dan Harlan's presentation with a horror movie theme. There's also Johnny Thompson's classic presentation with a handkerchief and Derek Dingle's version of Ross Bertram's Coin Assembly. And, to top it all off, there's historic footage of Ross Bertram also performing and explaining his classic Assembly.